The improved Model B tester from Benz has automated the test process with microprocessor-controlled data acquisition. 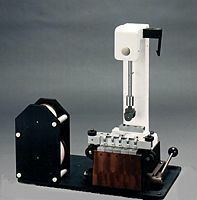 Designed to provide the expected internal bond strength for various types of paper, coated products and paperboard, this instrument measures the impact energy imparted to the specimen. The machine consists of a base, sample-preparation press, tape dispenser, dual-range pendulum (0 to 0.325 ft. lbs. and 0 to 0.650 ft. lbs.) and Digital Display. Internal Bond software is available. The specimen is held between the base and the anvil of the test fixture, using double-faced pressure-sensitive tape. One-inch-square specimens are prepared under calibrated pressure to insure uniform adhesion to the fixture and the aluminum angle. The impact force of the pendulum head striking the aluminum angle is displayed on the PC. time-saving reports - test results displayed on computer screen with previous results for comparison. The Model B also includes five sample bases, five sample angle holders, a knife-blade assembly, and pressure-sensitive tape.